Our Full-Size, High Roof, and compacty van bulkheads allow you to seperate the driver compartment from the cargo area for maximum protection against shifting loads. Exclusive polycarbonate windows improve visibility and safety. Tighter panel design ensures cabin comfort, both noise and temperature. 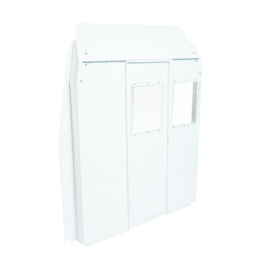 WEATHER GUARD® Bulkheads are available for all commercial van types and sizes, from high-roof to compact. Several bulkhead accessories are available to keep you organized. 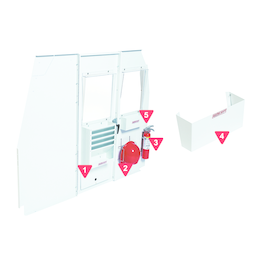 with sidewall and roof mounting brackets and pre-punched mounting holes for WEATHER GUARD® accessories. is used for strength and durability. protects you from loose object in the cargo area. allows easy loading of long materials by utilizing the floor space in front of the bulkhead. converts bulkhead to swing door version. 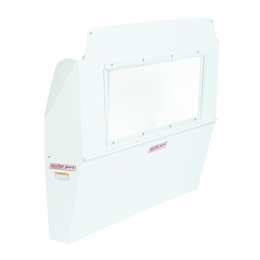 96101-3-01 Offers improved visibility and a large area to mount accessories while providing safety and security for occupants and cargo. 65 lbs. (Hinge Kit) Converts full size bulkhead to swinging door 4 lbs. 96201-3-01 Offers improved visibility and a large area to mount accessories while providing safety and security for occupants and cargo. 70 lbs. (Hinge Kit) Converts Nissan NV High Roof bulkhead to swinging door. 4 lbs. 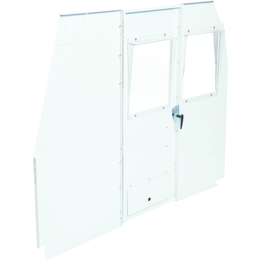 96121-3-01 Offers improved visibility and a large area for accessory mounts and holders while providing safety and security for occupants and cargo. 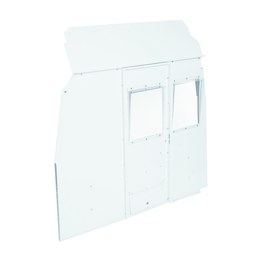 Includes upper panels for standard or high roof vans. 105 lbs. 96511-3-01 Solid bulkhead for Transit Connect with window offers unobstructed visibility of the cargo area, side door, and rear door. Maximizes comfort in the passenger area. 40 lbs. 96111-3-01 Lightweight mesh bulkhead for Transit Connect delivers full driver and cargo protection. 35 lbs. 96115-3-01 Lightweight mesh bulkhead for RAM CV delivers full driver and cargo protection 35 lbs. WEATHER GUARD® Bulkhead Accessories let you create a custom storage solution that securely organizes the items you need to locate quickly and easily. 1 9880-3-01 Literature Holder 10 lbs. 2 8875 Hard Hat Bracket 2 lbs. 3 8866 Fire Extinguisher 6 lbs. 4 8877-3 Practice Holder 4 lbs. 5 9876-3-01 First Aid Kit Tray 2 lbs.